Late last year, radar scans at King Tut’s tomb revealed the possible presence of a secret chamber. A more detailed analysis of this data shows not just the presence of a hidden room—but also unidentified objects that are comprised of metal and organic materials. 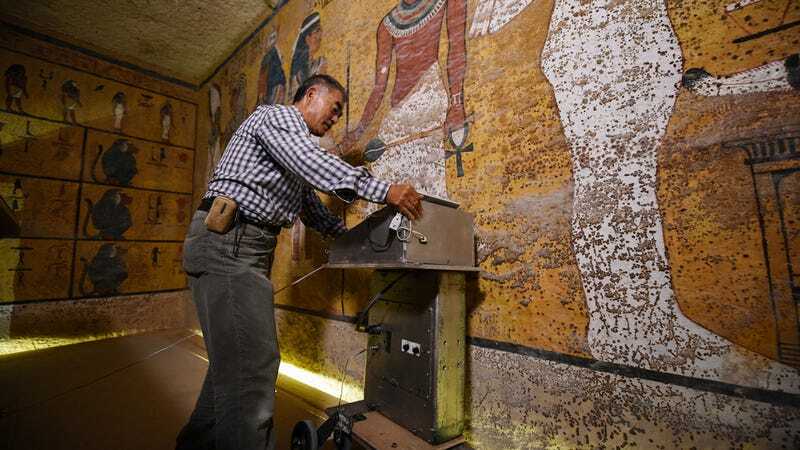 Back in November 2015, Japanese radar specialist Hirokatsu Watanabe was brought in to scan the west and north walls of Tut’s burial chamber. At the time, the initial results were compelling, suggesting with “90 percent” certainty that another chamber lay behind the north wall of the tomb. Watanabe has now released his full report—and he believes there are objects made of metal and organic materials on the other side. The Egyptian minister refused to speculate about what those object might be. Archaeological geophysicist Jason Herrmann told NatGeo that it’s relatively easy to use radar to determine details about unseen materials, noting that he’s used the technique to find metal artifacts buried within sand dunes in the United Arab Emirates. Moreover, he said that detecting metal objects in a room should be easier than detecting it in sand. Interest in Tutankhamun’s 3,340-year-old tomb was rekindled by British archaeologist Nicholas Reeves, who believes there may be another tomb hidden behind the walls. Although initially rejected by many Egyptologists, his theory was based on physical evidence at the site indicating that traces of passageways and door openings had been plastered and painted over during the preparation of Tut’s chamber. Reeves speculates that a hidden chamber contains the remains, and possibly intact grave goods, of Queen Nefertiti, the wife of the “heretic”monotheistic pharaoh Akhenaten, King Tut’s father.